ICC Cricket 1992 World Cup - Highlights & Memories. 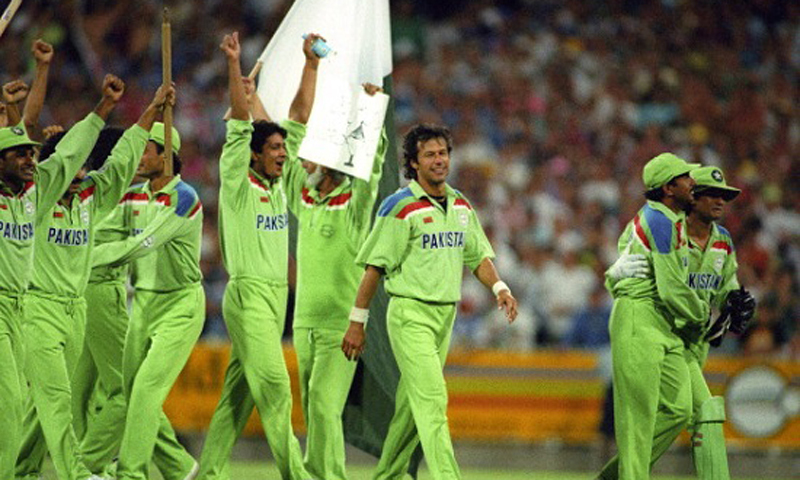 The history match was won by Pakistan under their captain legend Imran Khan.The final of the 1992 World Cup was played at the Melbourne Cricket Club on 25 March. Featuring cricketing legends like Imran Khan, Wasim Akram, Javed Miandad and (a young) Inzamam Ul-Haq. The final of the 1992 World Cup ICC Cricket was played at the Melbourne Cricket Club on 25 March. The match was won by Pakistan under their captain Imran Khan who defeated England by 22 runs to lift their first ever World Cup trophy. This was the second Cricket World Cup final to be played outside England and the first in Austrailia. Austrailia. 87,182 spectators turned out to see the final and the stadium was fully packed during the match. The 1992 World Cup final will be remembered by all Pakistanis as they saw two of their greatest cricketers, Imran Khan and Javed Miandad, perform superbly as they set a target of 250, which proved too much for England to chase. The final began with eerie resemblances to same fixture earlier in the tournament when England bowled out Pakistan for a paltry 74, as Derek Pringle dismissed both Pakistani openers at 24. However, Imran Khan and Javed Miandad settled down to see off the new ball. A crucial moment occurred when Imran Khan was dropped by Graham Gooch at 9 runs. He later went on to score a match-winning 72. At the 25 over mark, Pakistan had only scored 70. Javed Miandad, one of the best batsmen at the time along with his skipper Imran started to accelerate the scoring rate. It was an extraordinary partnership which started off from merely blocking every ball to steadily lifting the run-rate. Javed fought through pain and injury and by the time he got out at 58, Pakistan was placed at 163 after 39.3 overs. Javed and Imran scored 139 runs together and the last 87 runs of this partnership came in just 75 balls.They both got out and followed by an onslaught from Inzamam (42) and Wasim Akram (33) enabling Pakistan to give England a fighting target of 250. It was a tremendous recovery as Pakistan scored 179 off the last 25 overs. England's start was shaky. Ian Botham was dismissed for a duck by Wasim Akram, followed by Stewart, Hick, and Gooch, which left England tumbling at 69/4. A solid partnership of 71 between Allan Lamb and Neil Fairbrother left Imran with no choice but to give an early second spell to his main pacer Wasim Akram in the 35th over. The decision wrote the fate of the match. Two magical deliveries from the great left-arm fast bowler showed Allan Lamb and the dangerous Chris Lewis the pavilion door. Soon Fairbrother was caught by Moin Khan off Aaqib Javed to seal England's last hope. When the cards were laid down, Captain Imran Khan had the last laugh when end man Richard Illingworth was caught by Ramiz Raja off his delivery to finish off the final and crown Pakistan World Champions of cricket. On 25 March Pakistan wins 1992 World Cup Final. Great tournament and great final too.Featuring cricketing legends like Imran Khan, Wasim Akram, Javed Miandad, (a young) Inzamam Ul-Haq and Ian Botham.